An idyllic garden office with fully glazed aspect to the rising sun and a golden view of the top of the tallest Doric column in the world - and with a luxury apartment attached - is now available to buy for £365,000. The office is broadband connected with power supply & heating, and comes with a 2 bedroom luxury apartment attached. They are located in Shrewsbury, the county town of Shropshire, a hotbed of home-based entrepreneurs where networking is a happy pastime and these mobile business people enjoy some of the highest levels of open space per head of population in the country. The cultural life is lively with the left bank of the county a home to a talented tribe of contemporary artists, here for the inspiration and quality of life the county provides. 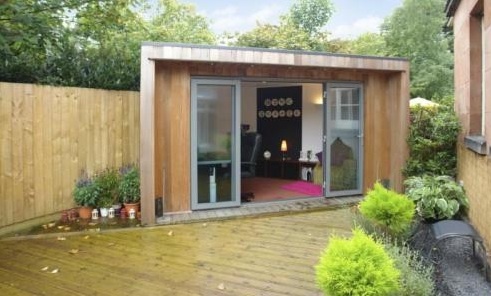 Jelly co-working groups abound and the lucky purchaser of this Home Office would not be short of entrepreneurial company. Shedworking can personally vouch for the seller's credentials. Click here for details.